In the Norwegian fairy tale of the Three Billy Goats Gruff, the three goat brothers are trying to cross a bridge to graze peacefully in the fields beyond. They’re stopped by a troll until the oldest, biggest goat knocks the troll into the stream below (spoiler alert). On February 15, Studio Woe released the latest expansion to the Gruff universe, Rage of the Trolls, to retail. In honor of this, we’re going to take a look this week Gruff, their seminal entry into this odd and curious LCG world. Next week we’ll take an in-depth look at Rage of the Trolls. 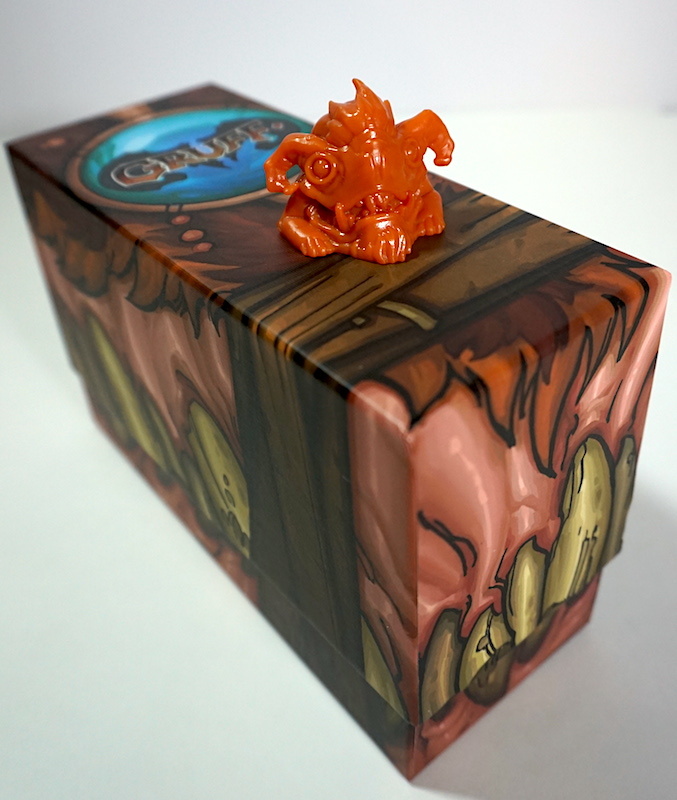 Gruff is a two-player tactical battle game similar to Magic: The Gathering, or Pokemon (though it is not a collectible card game). In Gruff, you play as a Shepherd, shepherding a flock of mutated monster goats called Gruffs. Your goal is to kill all of your opponent’s Gruffs OR to kill your opponent’s Shepherd. Shepherds have two stats associated with them: Life and Crazy. Life is, obviously, the health of the Shepherd. All Shepherds have a special ability they can use during the game, and some Shepherds have a “life threshold”. When their Life drops below the threshold, certain other effects occur. Crazy is the Shepherd’s ability to cast spells/use abilities. Unlike life (mostly), Crazy is a stat that grows over the course of the game. This leads us to our Gruffs. Gruffs are goats that are the mutated descendants of the three Billy Goats. Some of them look vaguely goat-like. Most do not. They have three stats: Mean, Fat, and Weird. Mean is a Gruff’s permanent attack power. Fat is its permanent defense power. Weird is a unique stat. Every time a Gruff is activated, that player’s Shepherd gains an amount of Crazy equal to the Weird stat on the Gruff. This amount never goes down. At the beginning of the game, each player will select a Shepherd and three Gruffs from the available collection to be part of their flock. Each Gruff has their own specific deck of cards associated with it. 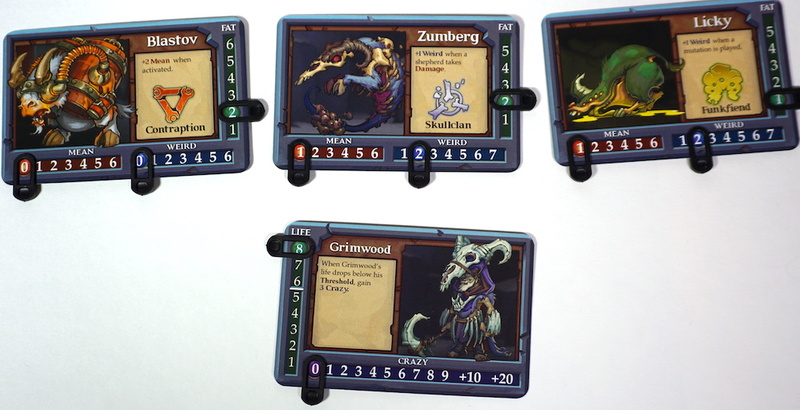 Once each player selects their Gruffs, they choose eight cards from each Gruff deck and shuffle them together. They then set aside the remaining cards and do not use them in this game. 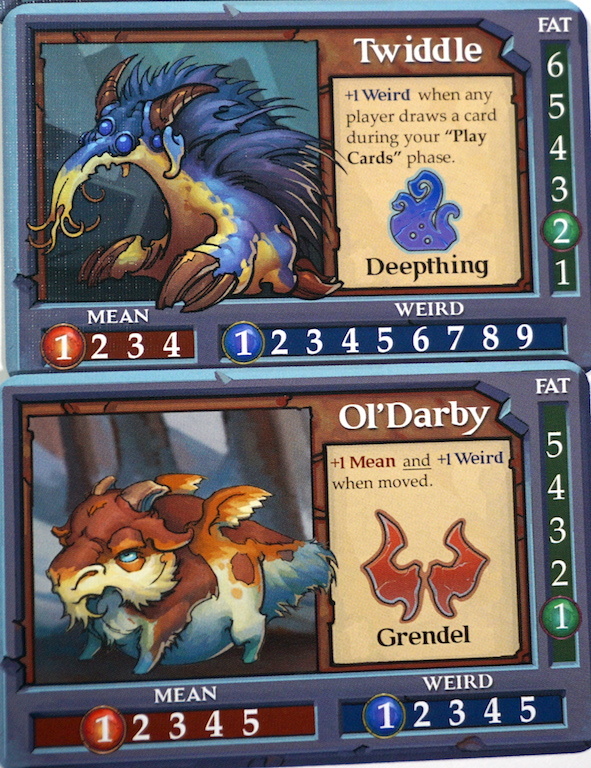 Players place the three Gruffs side-by-side in a line with the shepherd behind the middle one. The last step for setup is to put clips on each card. Every Gruff and Shepherd has counters along the bottom and sides that track their stat values. 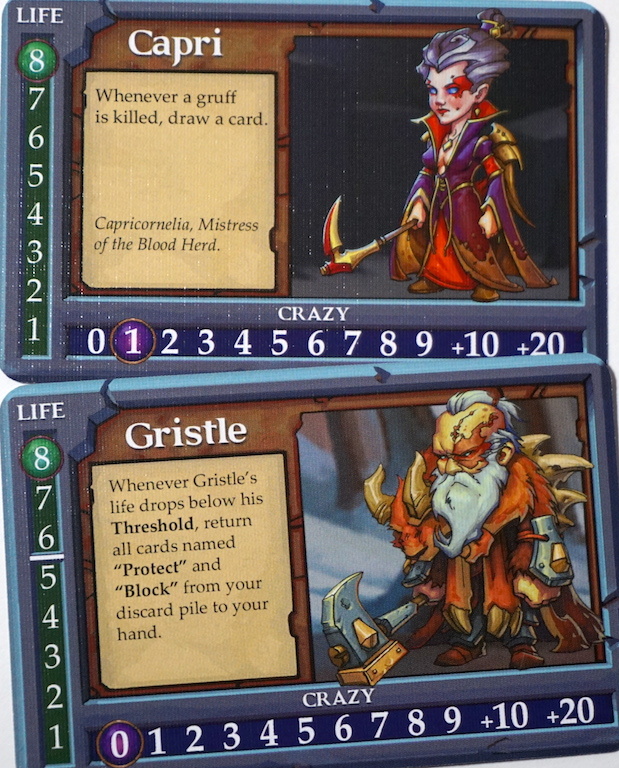 The Gruff box contains clips that slide along these cards, identifying the current stat for a given measure on a card. Every stat track has a highlighted stat that indicates the “starting value” of this stat. This completes the starting setup. Players draw five cards from their deck to begin (seven card max). The active player begins their turn with a “Clean Up” phase before drawing a card. The “Clean Up” phase involves resolving attacks, removing conditions, and refreshing Gruffs. After a player draws a card, they “Activate” a Gruff. This means choosing a Gruff and turning its card sideways (like “tapping” in a traditional LCG/CCG). Many Gruffs have abilities that take effect when they are activated, including increasing Fat, Mean, or Weird stats, or a few other things. The Shepherd’s Crazy value increases by the Weird stat on the Gruff (prior to any abilities). With a now active Gruff the player can play any number of cards from their hand as long as the total cost (upper left hand corner) does not exceed the Shepherd’s Crazy in that turn. 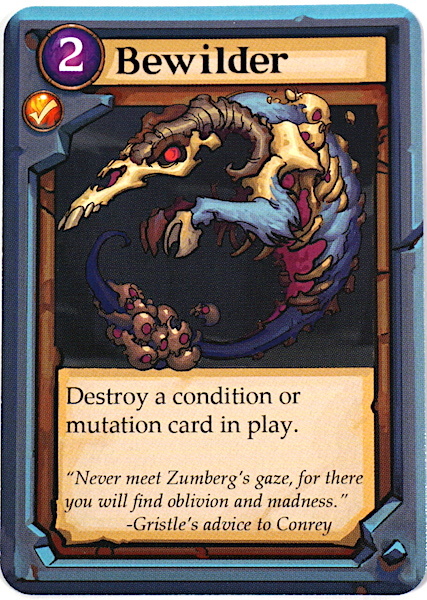 These cards can be Actions (instant use cards that are discarded after use), Conditions (effects that last until the player’s next “Clean Up” phase), or Mutations (effects that are permanently assigned to a card until they are forcibly removed). After the player has finished playing cards they take a “Tactical Action”. These actions can be Attack, Move, Grow, or Resurrect. Attacking with a Gruff is the most direct way to kill an opponent’s Gruffs or damage the opponent’s Shepherd. To attack, the player slides the activated card forward, indicating it is attacking. Attacks only deal damage. Attacking Gruffs do not take damage even when blocked by another Gruff with a Mean value. If the Gruff is still alive during the player’s next “Clean Up” phase the attack resolves. The Gruff’s Mean plus any modifiers is the attack power. A defending Gruff’s Fat plus any modifiers is the defense power. Gruffs can defend whether active or inactive. If the attack power of the attacking Gruff is greater than the defending power of the defending Gruff, the defender dies, and any extra damage continues through to damage the Shepherd. The defending Gruff is flipped over to indicate it is dead. If the attacking Gruff is attacking in a lane across from a dead Gruff, the Shepherd receives the full attack. Damage to Gruffs does not persist across rounds. If the attack power of an attacking Gruff is less than the defense power of a defending Gruff (minus any damage condition or mutation cards may have applied), they bounce off each other and nothing happens. The Move tactical action is much simpler. The active Gruff can exchange places with an adjacent allied Gruff. The player can use the Grow tactical action to increase any one stat on the active Gruff, provided there is still room for the clip to move up. Finally, players can choose the Resurrect tactical action to resurrect a dead Gruff. Any mutations remain on that Gruff. Gruffs are “Exhausted” by being activated. During the “Clean Up” phase, if all Gruffs are exhausted for a player, they all return to ready, to be used again. A player wins when they kill the other player’s Shepherd or when their turn begins and the other player’s Gruffs are all dead. There are play variants to support more than two players, and with next week’s article we will take a look at Rage of the Trolls, which has Troll AI for solo play. There are some more particulars to the rules, but this brief walk through should help with the broad strokes. As is likely clear, Gruff is a little more complicated than most of the games we review on this site. Nonetheless, my seven-year-old was able to grasp the relatively straightforward mechanics after a few practice turns. That being said, the mechanics are fairly non-standard, so if you’re the type of gamer who jumps back-and-forth between lots of games, you might find yourself referring to the rulebook a lot. The game is a bit of a back-and-forth dance with the timing of attacks. It remained balanced as the powers slowly ratcheted higher in most of our play sessions. 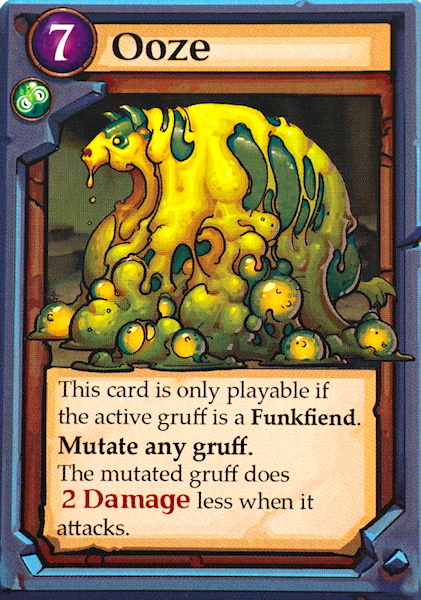 Players must play a balanced game without relying too much on a single Gruff due to the requirement to activate all Gruffs before refreshing them. Gruff was the first asymmetric battle game I had played, so I was led astray by my normal expectation of exchanging blows in combat. Once I was able to get my head around the idea that Gruffs either dealt or received damage, I changed my tactics and it made for a very interesting game. What really sets Gruff apart is the sliding clip mechanic. It isn’t a particularly shocking addition to a card game, but it’s a clever way to maintain upgrades to cards without needing to manage a massive (60+) deck. Also, Gruff does have a bit of setup. Every time you sit down to play you need to select Gruffs and choose cards from their respective decks. Unless you play this game a lot you will likely need some time to review the respective Gruff’s cards. This isn’t necessarily a bad thing; any card game fan loves flipping through cards and looking at abilities. The game is a lot of fun to look at, though. 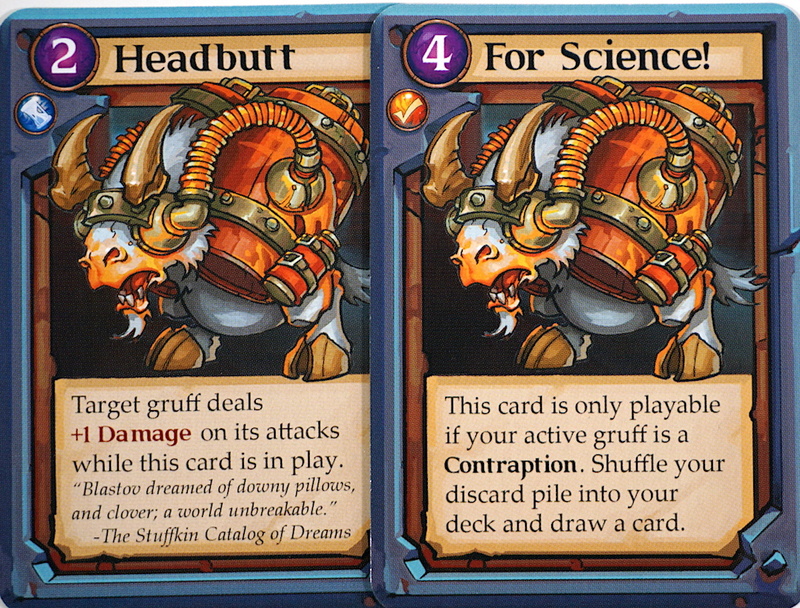 Even though all of the cards for a given Gruff share the same card art, each one is a bit of a spectacle. There are some nice design touches, including flavor text, and the subtle but helpful iconography will suit any player even if colorblind. Thematically, Gruff is incredibly unique and is certainly unusual, but sometimes it’s fun to embrace the weird. If you grew up with collectible card games and are looking for something with similar depth but less risk to burn a hole through your wallet and into the cement, Gruff delivers the tactical battle complexity to scratch that itch. Our review represents our perspective of Gruff as a *family game*. There are a fair number of minute details that go into the mechanics of the game, and this doesn’t lend itself well to a family setting. However, this may be exactly what you’re looking for. The Gruff base game has 15 Gruffs and 7 Shepherds to choose from. It is available on Amazon for about $30-$35 or direct from Studio Woe. If you’re interested in sampling the game, Clash of the Battle Goats offers just enough Gruffs and Shepherds to support two players at half the price. Studio Woe provided a review copy of Gruff to The Family Gamers. I love Gruff. I met Brent at GenCon in 2017. My kids love it too. The game play is interesting. While the concept shares some ideas with MtG, it has a stronger one-on-one feel to the combat. Your shepherd feels more like he/she is in the thick of things! Keep up the good work. I completely agree. Initially I included a comparison to Ascension for this exact reason, but it’s not a deck builder and the review is already a bit long. I love how passionate Brent is about this project and I love the unique place Gruff holds in our collection. In a board game renaissance where so many games can blend together, Gruff stands very alone and unique.